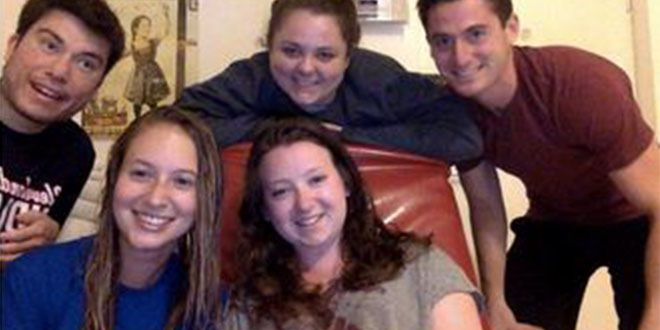 Sammie (center) with friends in her apartment in Israel. In some ways, I was not the typical Onward participant because I have been to Israel a few times. This trip was my 4th trip to Israel, and I have to say, I never thought that I would be able to connect so much to the country. I grew up in a Conservative Jewish home and went to Beachwood public schools and had a strong sense of tradition and culture. I have gone to Israel on a few different trips, including Birthright in College. In 2014, during the start of “Operation Protective Edge,” I felt helpless and convinced my parents to start going to synagogue on Saturday mornings, not because I wanted to, but because I felt it was the only thing I could do at the time, that gave me a sense that I was connected to what was happening in Israel. I don’t have a strong connection to very religious aspects of my Judaism, however I connect deeply to the culture and traditions of my family and the State of Israel. I want to share a little about what led me to do Onward this summer. Last Fall I started the first Israel Advocacy group at Case. I had attended a lecture in early 2015 on the conflict in the Middle East. The speaker was a political science professor and lecture was extremely biased. I wanted to go up to the professor after the lecture, but I knew that I wasn’t prepared and would not be able to effectively have a discussion with him, especially with my emotions running. I realized I never received the tools to really understand and talk about what was going on in Israel. 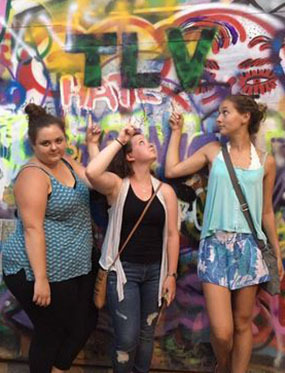 With the help of a friend and our Israeli Fellow at Cleveland Hillel we created the first advocacy group focused around education and promoting Israeli culture. I knew I needed a more personal Israel experience to be effective on my Campus. Even though I had been to Israel before, I didn’t have the opportunity to just live there- get a sense of what peoples’ opinions are of the conflict and many other things. I needed to create my own story to be authentic and not just repeat what others say about Israel – I wanted an experience and understanding to bring back to my campus and my community. I found out about Onward Israel during my freshman year at Case. I decided I wanted to do the program because it would give me the chance to live like an Israeli, to understand Israeli life better, and give me the chance to gain professional skills and land a good internship. The internship I got exceeded my expectations and it was a dream come true. Since I’m an accounting and environmental studies student, I wanted to do a business development internship for an environmentalism company and was open to larger corporations as well as startups and nonprofits. I was really unsure that I would be able to find something I was looking for because it is not very common. I figured I would have to be flexible. Through Onward I ended up working at an environmental consulting startup called ecoOS, which was the perfect intersection between business and sustainability that I wanted. The employees were warm and welcoming and we all got close. I learned new skills, and the company utilized my business interest and background to give me projects that fit specifically to what I wanted. I did data collection and analysis, worked in the software that they’ve spent the last 3 years developing, and worked on the Corporate Social Responsibility Report for Israel Chemicals, which is a Fortune 500 company. This was the coolest part of the job for me because I have found a company in Israel that does the work I hoped one day I’d be able to do. I have one story of a work-day that, I think, could only happen in Israel. One day we were randomly offered a free yoga lesson. We went a little early to work and met at the Herzliya beach to do yoga (yes, our boss did it with us). Then, we went to the office and put in our day at work. At the end of the day, we went back to the beach and did a group surf lesson. Can you imagine that happening in Cleveland? Even though the work was highly demanding, because we were able to bring our personalities into the workplace, we became more effective workers. Getting exposure to what it is like to work in a small company was valuable to me. The informal setting gave me the opportunity to have an authentic relationship with Israelis. I had the chance to hear the many different and often conflicting opinions of Israelis on everything! Whether it was going out with coworkers after work, or having conversations with a waiter during a slow time. Little interactions are what makes the big difference in bridging gaps. I truly felt thankful for every breath I was able to take in Israel. I am looking forward to getting back on campus this Fall and sharing my experience, and I can say that after 2 months, I have more questions than I have answers. I know that nothing is black and white, there are multiple sides to every argument. I learned that Israel is not perfect- but I love her more because of the imperfections, and now I can more honestly and authentically advocate for her on campus. I no longer feel helpless. I am looking forward to leading the Israel Advocacy Group this year. I now have a better sense of what I can do on Campus. The complexity and beauty of the country will shape what events and speakers we bring to Campus and it will shape how I speak about Israel to others. Thank you for the opportunity to go on Onward, it was life-changing! For more information about Onward Israel, please visit www.clevelandonwardisrael.com or contact Mirit Balkan at mbalkan@jcfcleve.org or 216-593-2921.